Far-right websites The Gateway Pundit and Natural News attempted to discredit Christine Blasey Ford by claiming her report that Supreme Court nominee Brett Kavanaugh assaulted her was politically motivated because of Ford’s previous work for a pharmaceutical company that manufactures a so-called “abortion pill.” In reality, the pill that the company makes is not approved for that use and cannot be prescribed for people who are pregnant. A September 17 San Francisco Chronicle article about Ford noted, “According to her faculty biography in a course catalog, she worked as director of biostatistics for Corcept Therapeutics in Menlo Park.” Corcept Therapeutics does manufacture Korlym, also known as mifepristone, but the company’s website notes that the drug is intended “to control hyperglycemia associated with Cushing’s syndrome, a rare, debilitating endocrine disorder.” Hoft and Adams both acknowledged that this is the medication’s intended use. Pregnancy must therefore be excluded before the initiation of treatment with Korlym and prevented during treatment and for one month after stopping treatment by the use of a non-hormonal medically acceptable method of contraception unless the patient has had a surgical sterilization, in which case no additional contraception is needed. Pregnancy must also be excluded if treatment is interrupted for more than 14 days in females of reproductive potential. Adams said this disclaimer only serves as “a wink, wink message to doctors that this is actually an abortion pill,” enabling them to secretly prescribe Korlym to patients seeking an abortion. How exactly this would work — given the litany of restrictions on abortion access and even some limits on what doctors are allowed to tell patients about various procedure — is unclear. 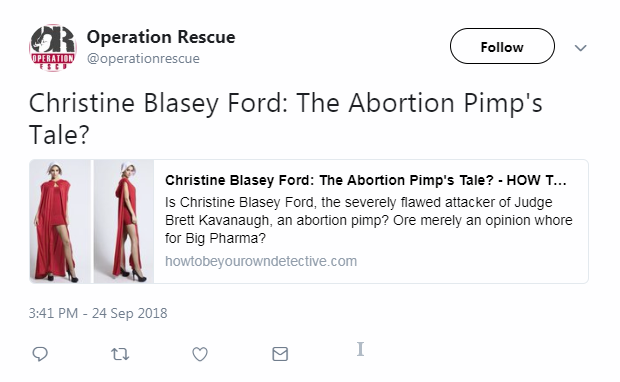 Anti-abortion group Operation Rescue — which has not been shy to attack Ford or voice support for Kavanaugh — also shared a link to a truly bizarre blog post calling her an “Abortion Pimp” because of her work with Corcept. Right-wing and far-right media have relentlessly attacked and harassed Ford since she went public with her account. This latest smear about Ford’s promotion of a so-called “abortion pill” looks like more of the same.